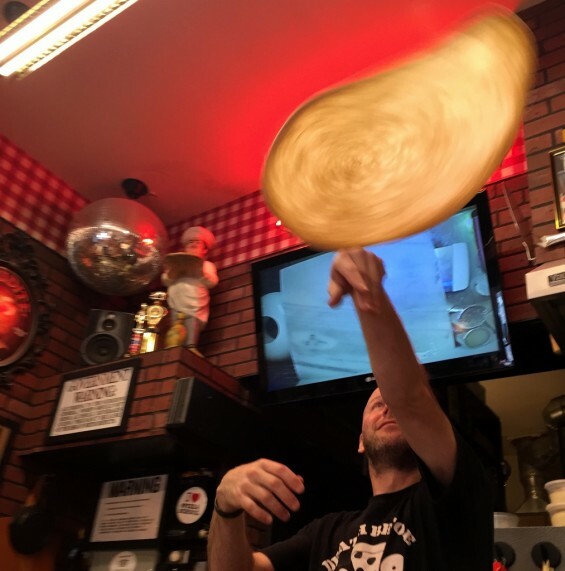 So this year for my birthday, Adam gave me a gift certificate for a class at Pizza a Casa pizza school in Manhattan. I didn’t get a chance to use until a few weeks ago, as an end-of-the-school-year extravaganza. And it was awesome. I haven’t written much about BYW, the ecourse I’ve been taking for the past month. But now the class has ended, and I’m about 3 days late posting my final homework assignment. But this cold and ear infection have had me on my back all week. This is actually my 3rd attempt today to sit down and post something; I get about 5 words in and have to put my head on the desk to stop the world from throwing me off of it. Fun, right? And I’m really trying to go back to work tomorrow. So I’m kind of forcing myself to plow through (4th attempt) and get back to normal. Do colds and ear infections work that way? Do they go away from sheer stubbornness? (5th attempt). We have been on the move since 8am without coming back to our hotel room once. 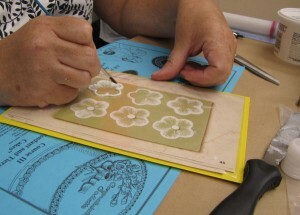 First we took Barbara Barber’s paper piecing class from 9am-4pm. She is a British quilter who was really great. I took a ton of photos to remind me of how to do this in the future, and I shot some goofy video. I’m going to edit all my video snippets together at the end of the trip, I’ve decided. I had such a good day yesterday, I don’t know why I don’t spend more time in Philadelphia. I grew up near NYC, Adam lived there when we met, then we lived in Hoboken for 3 years, I worked and went to grad school there. So I’ve always orbited around NYC. But since we moved to the shore I keep forgetting that Philly is almost as close. An hour to NYC now (1.5 by train), and 1.5 hours to Philadelphia. 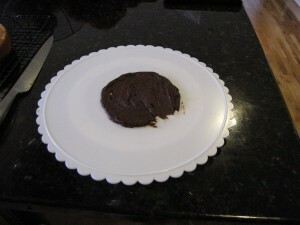 I’ve now started the 3rd class in the Wilton cake decorating series, which focuses on fondant. 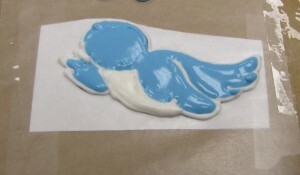 I’m extremely excited about this class since I’ve wanted to work with fondant forever and find it kind of daunting. But my concerns so far with this class are how to make the stuff actually taste good (there’s a reason we went with cupcakes instead of a fondant masterpiece for our wedding) and how hard it is to knead food coloring into it. Seriously, unless you want to make white cakes forever there’s a lot of elbow grease that goes into prepping fondant. Which I knew, I just didn’t know how much. So I signed up for the second class in the Wilton cake decorating class series, but I missed the first day for Back to School Night last week. I had major catching up to do. Other posts from this class: My Cake Decorating Class Has Begun!, Cake Decorating Class Pt. 2. 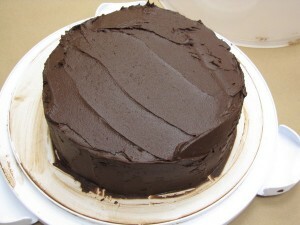 This is a super-sized post because I’ve got 2 recipes to share as well as photos of icing this cake. This week in cake decorating class we learned to make hearts and dots, but most of the class was spent on making scary clowns out of frosting. I tuned out almost this entire lesson, as I have a FEAR of CLOWNS. 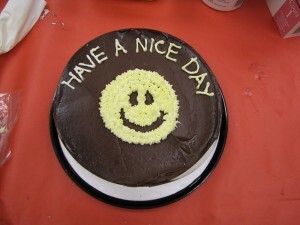 But I was rewarded when we learned how to transfer designs on to our cakes. I’m going to a lobster bake this weekend, and I’m bringing a dessert. 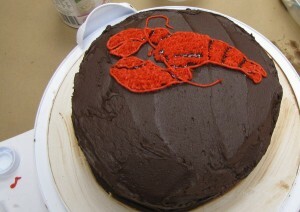 So I found a clip art picture of a lobster in MS Word and used that as an outline for this crustacean on my cake. I’m kind of in love with it, I’m this close to naming the lobster. I just have to add the lettering and it’s set for Saturday. 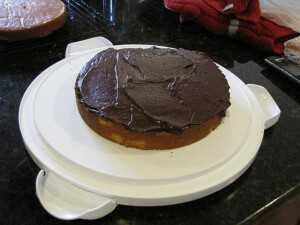 As for the cake itself, I used the All-Purpose Buttery Yellow Cake and Dark Chocolate Frosting recipes from America’s Test Kitchen Family Cookbook. Before I share the recipe, here are some photos of me finally frosting a cake nicely. A dollop of frosting to stick it to the plate. I actually took this photo then decided to use the base of my cake caddy instead, so it looks different in the rest of the photos. Also, I forgot to put pieces of parchment paper under the cake to keep the plate it’s on from getting dirty. So now my cake caddy looks very chocolatey. 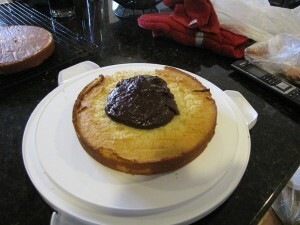 First layer down with probably 1-2 cups of frosting in the middle by the time I was done. 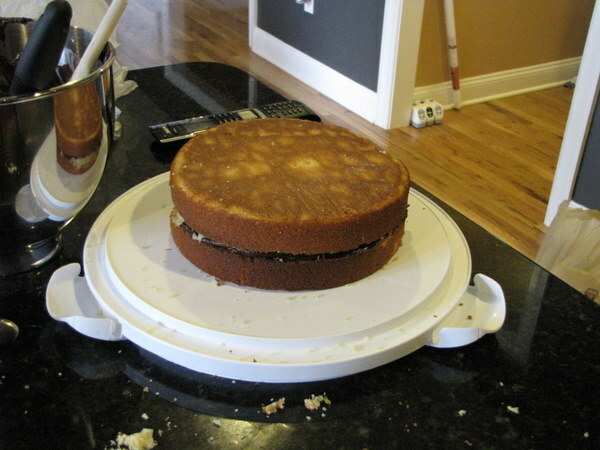 I bough this great tool for cutting the “dome” off layer cakes so they’re level and easy to frost evenly. Layer two is now on. I arranged the layers so the top of the 2 cakes actually face each other in the middle. That’s the bottom of the 2nd layer you see on the very top. This is probably perfectly logical, but I never thought to do these kinds of things before. I got kind of swept up in the fun of frosting a cake without all the fuss I’m used to, and I forgot to take photos as I went. But here it is, all frosted. Other posts from this class: My Cake Decorating Class Has Begun! I have decorated my first cake for this class. Okay, so I cheated and bought the cake AND the frosting in a frantic rush on my way to class last night, but the idea for the design and the execution are all me. 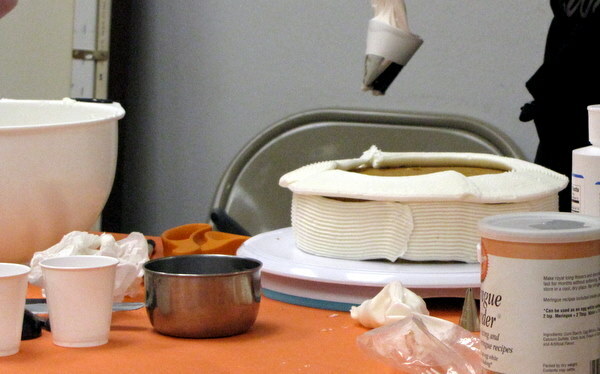 Last night was the first session, and our extremely patient and sweet teacher (some of my classmates would NOT stop talking while she was talking) showed us how to properly ice a cake. This is worth the $30 class fee right there to me. I know, $30! It’s a steal, AC Moore classes are great. This is my first one, and so far I’m not disappointed. It would seem the biggest problem with my frosting skills is that I need to be using about twice as much frosting as I was previously using. 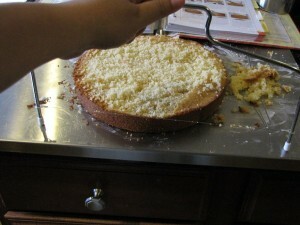 And I need to cut the dome off so the cake is level.